By Daniel Horowitz--As a new storm began its assault on New York City and other parts of the Northeastern United States on Wednesday, November 7 just a week after Hurricane Sandy tore a path of death and destruction across the same part of the world, Alisa Rubin Kurshan spoke with pride about the vital role UJA Federation of New York is playing in Sandy’s aftermath. 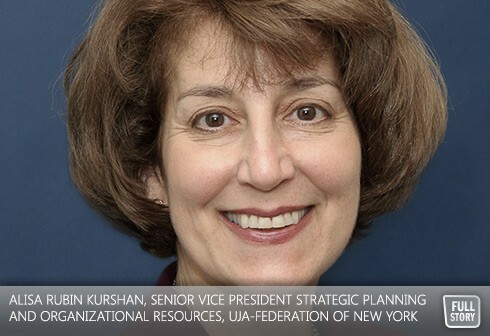 “This is what UJA Federation is all about,” said Rubin Kurshan, Senior Vice President Strategic Planning and Organizational Resources, UJA-Federation of New York, as she surveyed the worsening weather outside her office window. For those of us watching the tragedy from a safe distance on television is one thing but quite another when directly immersed in the unthinkable. And, just how do the employees of UJA Federation of New York devote their time to helping strangers when they, and their families, are faced with the same peril? According to Rubin Kurshan, UJA Federation is particularly effective because it has the ability to galvanize the resources of its donors, many of whom are volunteering across the city, including the busloads of Women’s Philanthropy members as well as its Emerging Leaders and Philanthropists group who volunteered downtown last weekend. And, thanks to social media, word spreads pretty quickly these days. And, in a perfect example of “giving back”, in the early days of the intifadah, UJA Federation of New York gave four $25,000 grants to fours small agencies in Israel that worked in the field of psycho-trauma. Little did UJA Federation know then that those four grants would be the beginning of what is today the Israeli Trauma Coalition, which is now 60 agencies strong and a world-renowned expert in psycho trauma support. It’s been said that sometimes it takes the worst to bring out the best in people, and clearly, Rubin Kurshan, is impressed with what she’s seen over the past ten days.